Sumo of Doom-o is a Duel minigame in Mario Party 6. The players emerge inside their vehicles from doors on top of the arena. The Thwomp then pounds the ground, causing the ramps leading to the exits to fall. The point of the game is to knock the other player off the quadrilateral fighting platform the players are both on. To move, players have to coordinate between using and ; as controls the left set of tires, whereas controls the right set. Whoever bumps the other player off by bumping into him or her wins. Every few seconds, the Thwomp in the upper center of the stage pounds the floor, making the rim of the platform fall off. The Thwomp stops pounding if only the middle part of the platform is left. The winner stands outside his or her vehicle and performs his or her victory animation. 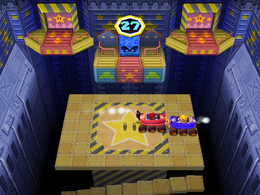 Rules – "Use your vehicle to push your opponent off the crumbling platform. Whoever knocks the other player off first wins!" Advice 1 – "Tilt and to steer your vehicle. Tilt both upward to move forward." Advice 2 – ""The stage will crumble away and get smaller each time the Thwomp lands." French Bulldo-Sumo Portmanteau of "bulldozer" and "sumo"
This page was last edited on January 18, 2018, at 12:39.